Any musician who travels knows the struggle. That beautiful, full-sized acoustic that you love just doesn’t quite work on the road. It’s bulky and heavy to carry around. It takes up too much room in the trunk, or they won’t let you bring it on the plane, forcing you to pay outrageous prices to throw it in with the checked luggage. On top of all that, the constant humidity and temperature differences that come with traveling can wreak havoc on your guitar’s wooden body. You have to worry about tuning and intonation changes at the very least, and extreme cases may even result in damage. Enter the KLOS Guitar. 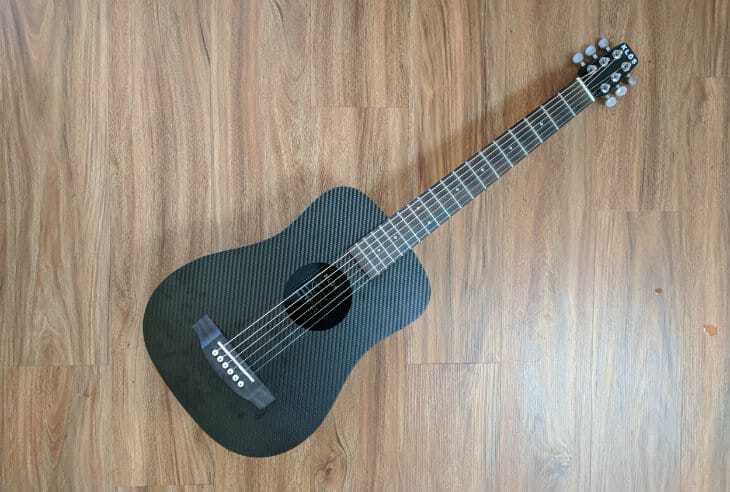 This full-scale length, portably-sized carbon fiber travel guitar is designed to eliminate the worst problems that arise from traveling with a guitar. And it promises to do so without sacrificing the tone, volume, and playability that you love about your favorite acoustic. We spent over a month playing around with this innovative instrument, and we think the KLOS guitar absolutely lives up to the hype. 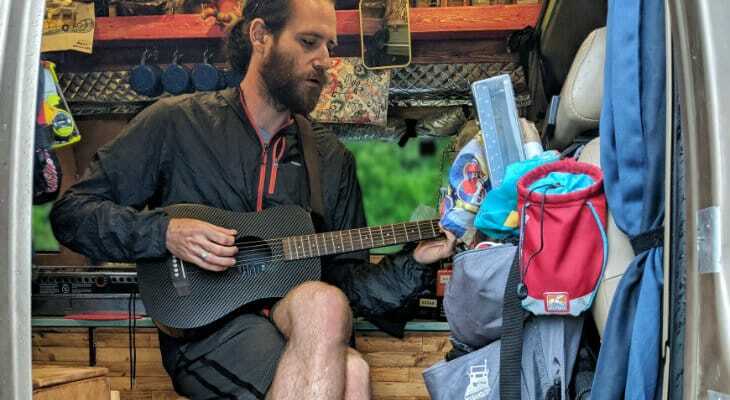 Read on to see why we think this is the best overall guitar for traveling, camping, backpacking, or just knocking around. What is the KLOS Guitar? The KLOS guitar is a small-sized “mini-dreadnought” style travel guitar. With a full-scale detachable neck and a carbon fiber body, you can take this guitar on the road without worries or compromises. KLOS guitars was founded by brothers Adam and Ian Klosowiak, and their guitar is a direct response to the common issues that afflict wood-body guitars and travel guitars. Funded by several wildly successful kickstarter campaigns, the KLOS guitar uses innovative design and space-age materials to produce a durable, portable guitar that sounds great and is a blast to play. Every KLOS guitar is handmade in Utah. The KLOS guitar features a body made entirely out of incredibly strong carbon fiber. Carbon fiber is a space-age material that’s used when only the strongest and lightest materials will do. Carbon fiber is common in the aerospace, automotive, and high-end sports industries. This means that the KLOS guitar is not only very durable – it also won’t respond to temperature and humidity changes. That means a more stable instrument that will maintain its tuning and setup no matter the environment. The soundboard is a unique “sandwich” of two thin layers of carbon fiber with foam in the middle. This combination of materials creates a soundboard with a similar sonic resonance to wood sound boards. In case the KLOS isn’t compact enough already the neck is easily detachable. Simply unscrew the four screws holding the neck onto the body, and you’ve got an even smaller package to stuff into an overhead compartment or strap onto a backpack. You can upgrade your KLOS guitar to include carbon fiber stiffening rods in the next, which further strengthens the guitar and helps it remain stable in any environment. You can also add on an accessories package that includes a gig bag, rain cover, neck sheath, capo, and custom strap. It’s easy to make the mistake of thinking that a miniature, non-wooden guitar just wouldn’t hold up in the sound department. But the KLOS guitar actually sounds kind of awesome. The tone it puts out isn’t directly comparable to a solid wood guitar – it doesn’t have the same complexity and rich overtones that you’ll find with a vintage Martin. But that’s not a bad thing. The KLOS guitar is a different breed, and it projects a distinctive tone that’s a joy to hear. The more we played the KLOS, the more we came to appreciate its sound, and the more we wanted to play it just for the tone. Our other guitars were neglected a bit while we had this one around. The tone is difficult to describe – almost like the mellowness of an acoustic guitar combined with the smoothness of a clean electric. But no matter how you describe it, this guitar has a beautiful sound. The volume the KLOS guitar puts out really impressed us, especially for a guitar of this size. This little guitar can get surprisingly loud if you want it to, but it’s also really easy to back off and play quietly if you’re somewhere you can’t rock out. Both perfect qualities for the traveling musician who might want to jam with friends one night and do some quite strumming in a hotel room the next. The KLOS guitar comes equipped with a mahogany C-shaped neck, and is fully set up with a nice, low action before shipping. The neck feels wonderful in the hands – it’s substantial but very easy to grip, and the stock action of our review model was pretty close to perfect. We had a lot of fun jamming on this guitar, which in our minds is the biggest test of playability. The KLOS is just a blast to play, and it’s really difficult to put down once you’ve started. If you like to play way up the neck, you may have a bit of trouble with this guitar. Although it is a full scale length, the body meets the neck sooner than on a full-sized guitar. That combined with the lack of a cutaway makes it challenging to hit the really high frets. This can be an issue with any small-sized guitar, so we’re not docking any points here. Overall, the KLOS guitar is a whole lot of fun to play. And because of its space age construction, you shouldn’t have to adjust the setup as frequently as with a wood guitar – meaning the KLOS will maintain its top notch playability much longer than a traditional acoustic. The KLOS guitar is pretty compact as it is, but add in the ability to detach the neck and it’s even easier to take this guitar wherever you need it to go. Once the neck is detached and the guitar is tucked away in its gig bag, the whole package is only 15” x 12” and weighs in at right around 3 pounds. And since this guitar is made out of carbon fiber, you don’t have to worry too much about it getting knocked around. It’s perfectly fine in a gig bag rather than a bulky case. The compact size and durable carbon fiber body make it a whole lot less stressful to travel with a guitar. We weren’t ballsy enough to try this ourselves, but KLOS has plenty of videos showing their guitar being used as a baseball bat and golf club, getting hit with a mallet on national TV, and even being run over by a Prius – and coming out completely unscathed. And since the KLOS guitar dramatically lessens the worry factor and is so easy to get out and put away, we found ourselves playing guitar a whole lot more than we normally would while traveling. That alone makes this a winner in our book. The KLOS guitar is our top pick among the best travel guitars out there. It offers a full-scale neck in a compact size, wonderful tone and playability, and the durability of the carbon fiber body means you don’t have to worry too much about this guitar getting knocked around. If you’re a frequent traveler, camper, vanlifer, or adventurer looking for a great-sounding and fun-to-play guitar that’s easy to take with you on your excursions, look no further than the KLOS. Its small size, detachable neck, and included gig bag make this a perfect traveling companion. 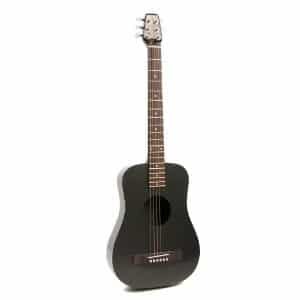 The compact size and easy action also make this an excellent guitar for children or beginners just learning to play.